After more than a decade of big dreams and bigger disappointments, Palo Alto officials on Monday resurrected their plan to deliver ultra-high-speed Internet to the city's masses when they approved a pair of contracts that could pave the way for the long-awaited "fiber to the premise" system. The effort, which entails expanding the city's existing 41-mile fiber network and giving residents and businesses throughout the city gigabit-speed Internet access, has been flickering on and off for years. Despite strong enthusiasm from council members past and present, the project has been chronically beset by woes and setbacks. These included the economic downtown, unfavorable economic projections and deep uncertainty over whether and how the network will actually work. The city's last promising effort fell apart in January 2009 after a consortium of Internet firms that was commissioned to build the new $44-million system saw its funding collapse in the global recession and requested a public subsidy, which the City Council refused to make. Since then, Palo Alto's dream of citywide Internet has been realized in cities all over the map, including Austin, Provo, Utah, Kansas City, Missouri, Chattanooga, Tennessee, and Lafayette, Louisiana. With the local economy now thriving and the city's Fiber Optic Fund enjoying a healthy uptick, the council voted 7-0, with Pat Burt and Cory Wolbach absent, to approve two contracts worth a collective $276,594 for the creation of a Fiber to the Premise master plan and a companion plan focusing on wireless services. The funds would come out of the city's Fiber Optic Fund, which draws money from the large commercial customers that currently use the city's dark fiber network and which now totals about $18 million. The plan is set to be completed in May, after which point the council will have to decide whether to proceed with the project and, if so, which business model to adopt for the newly expanded municipal utility. Under the newly approved contracts, the firm Columbia Telecommunications is charged with assessing the city's infrastructure, evaluate the impacts the system would have on the city's right-of-way and utility equipment; analyze the network requirements; prepare an engineering study; design the network; and offer a recommendation about the feasibility of a Fiber to the Premise Network and the best business model to pursue. One option, Jim Fleming, a senior manager at the Utilities Department, said, is the retail model in which the city provides services directly to the community. The city can also take the "wholesale" option, where it owns the infrastructure and then invites Internet service providers to use the city's network to offer services. The new study will evaluate the upsides and downsides of both models. "The focus of this is to figure out what is the best model for Palo Alto," Fleming said. Even as the city is laying the groundwork for a municipal system, it remains in the running for a a fiber network installed by Google. The tech company announced a year ago its plan to bring Google Fiber to 34 communities, including five in the Silicon Valley. Palo Alto made the cut, along with Mountain View, Sunnyvale, Santa Clara and San Jose. The company has initially said it would make a decision by the end of 2014, but that self-declared deadline had come and gone without bringing any resolution to Palo Alto. While Silicon Valley waits for Google's decision, the company announced week ago its plan to bring fiber networks to cities on the other side of the country, including Atlanta, Charlotte, Nashville and Raleigh-Durham. Jonathan Reichental, Palo Alto's chief information officer, said Google has informed the city that its decision-making process will continue for the remainder of 2015 and that Palo Alto is "very much in the running." But given the uncertainty over Google's decision and the 18 years that Palo Alto has already spent mulling a fiber network, Councilwoman Liz Kniss spoke for all her colleagues when she argued that it's time to act. "I think it would be embarrassing if we didn't move forward," Kniss said. "It's absolutely time to do this. We've been waiting a lot of time. We've been talking about this for two years and one month since I've been back on the council. We need to move in some direction. "I think this is the right direction, but I think this is the only way we'll find out whether or not we're heading in the right direction." One of the major challenges of Palo Alto's new venture will be competing for customers with incumbent carriers of high-speed Internet, namely Comcast and AT&T. Fleming said any newcomer looking to challenge the incumbent carriers needs to have a good marketing and customer-acquisition plan. "You have to know the market," he said. "And the incumbents are really going to come after you. They just will. That's the name of the game. They're very good at doing this. They have a lot of practice at this point and they will attempt to run you out of town." These hurdles did little to deter the council, which enthusiastically voted to move ahead with the effort. Council members agreed that a fully built-out fiber system would be a useful and valuable public utility. Some likened it to other city-owned utilities, including gas, water, electricity, and made a case for moving ahead with a municipal system regardless of what Google decides. "I think you can make a pretty strong case that this stuff, especially the physical infrastructure, is a natural monopoly and probably a public good and we should probably own it," Councilman Eric Filseth said. Several members of a citizen advisory committee advocated for a locally owned system over one built by Google. Andy Poggio, who serves on the committee, said he can't think of one successful large telecommunication company that "had the opportunity to abuse monopoly power and didn't take advantage of that opportunity." Richard Brand, who also serves on the committee, made a similar case for a municipal network. "We want to control it," Brand said. "We have our own utilities. Let's treat Fiber to the Premise like we treat our utilities and not turn it over to a third party." Councilman Tom DuBois agreed and said that while Google Fiber may ultimately be an option, "I don't think we should be waiting on Google." Rather, he proposed to go ahead with the groundwork on a plan for a "city-owned system that we can control." He also observed that other cities, including Lafayette, Louisiana, overcame the hurdles thrown at it by the incumbent carriers in adopting its fiber system. "Nothing against Lafayette, but those cities stood up to incumbents and it paid off," DuBois said. "I think it's time for us to move forward." Can't really blame Google for not wanting to build here. Why would they? We'll just get them mired in an endless process of reviews, oppositions, lawsuits, and all the usual drivel that is to be expected. We fully deserve the crappy Internet service that we're getting. The best marketing plan for municipal fiber is the service of Comcast and AT&T. If Palo Alto offered gigabit speed at a reasonable price, even without the cable TV baloney, that would be enough. Google Fiber is pushing the industry. Once people see how fast fiber is they will demand it and seek out any provider offering it. It is astoundingly fast compared to the 1990's technology we're currently forced to use by the big providers. The providers love using their old stuff and are racking in billions, but Google will force them to upgrade. This fiber infrastructure the natural progression until the .com crash. Then everyone stopped talking about it, but not for much longer. @PAmoderate - a moderate proposal here would be for the city to reach out to prospective providers like Sonic and see if they would take on building out the last mile of the fiber network. Way to go City Council! Please move forward as fast as practicable. Great to see our city making plans to roll out it's own fiber and not rely on Google or other incumbent monopolistic private entities. Google's business model is not altruistic. Having Google parse every byte of personal bandwidth delivered over it's fiber should be both expected and deeply disturbing. When you get something for free, you are the product being bought and sold. The FCC has said, "Our electric grid was the platform for innovation that, as much as anything, helped propel the United States to global economic leadership in the 20th century. Our broadband grid has the potential to play the same role for the 21st century. Where we once had electricity-driven appliances, we now have information-fueled applications." I hope the city can really get this moving this time. There is always a naysayer that creates doubt and confusion. I absolutely hate the ridiculously slow and sometimes unreliable commercial broadband service I have. Broadband is a commodity. You don't need heavy marketing effort to sell a commodity. Just cheaper or faster. I think that people worried about how Palo Alto would supply TV via the fiber. Who cares? TV ala Cable style is going away. The Internet will supply all TV, Movies etc directly without the special equipment or channel bundling of today. This is why ultra fast Broadband is necessary. Huge amounts of video streaming is the delivery system going forward. I contacted Dane Jasper at Sonic quite some time ago (3/19/2013). Interesting to see the dialog swing back toward potentially moving forward. network operator. We're expert at operation of the retail services. I tried Sonic and ATT. They don't offer broadband - at least not in my area. Only ~ 3mbs Plus the new definition of broadband is at least 25mbs. Go Palo Alto Fiber! I hope FCC goes towards treating it as a utility as it should have been from the start. Or lets see if Tom Wheeler has been bought and paid for. This is a terrible idea .. and demonstrates how little the candidates talked to the voters at the last election. Attempts to get information from a couple of the so-called “residentialist” candidates ran into a blank wall. Certainly having the City spend the 60-odd Million dollars that such a system will cost was never high on anyone's campaign priority list. The City has been mucking around with this idea since the board of directors of the so-called Cable Coop crashed that business, and they turned to the City for a bailout—after proposing a rebuild of their system on fiber base to a number of venture capitalists. The Utility spent about $125K eight or ten years ago on a study by a Colorado company who promoted a couple of fledgling municipal cable operations as a reason to go forward. The consultant was supposed to put together a business plan—which he failed to do. He wanted another $125K to finish his work. The Council prudently said no—based on the lack of substance to what he had done at that time. hardware/installation, and run the system for 15-20 years, turning it over to the City after it supposedly got its investment back. The outside company, at some point, asked the City for some help in funding the $65M. The City said “NO”, and shortly after that the Canadian company vanished. Other attempts at interesting VCs have failed—in large part because Palo Alto has such a small population, and there is very limited need for this sort of high-speed communication in the home. Most people have, over the years, moved to wireless communications. Smartphones are clearly where all of the development activity is these days—with very little evidence of a lot of software being developed to take advantage of 1gb home Internet service. Verizon decided to run fiber to the home in its East Coast service areas until a couple of years ago—when it announced a hiatus to their ambitious project. As it turned out, most people were not purchasing the very high speed service, but option for DSL speeds. The $125K partial business plan produced by the Colorado consultant suggested that a Palo Alto Fiber system would have to seriously displace both AT&T and Comcast as the provider of Television content and POTS telephone services. The consultant produced a spreadsheet that made a number of assumptions about the penetration of each of the Palo Alto Fiber product into the AT&T/Comcast services. When asked for the data upon which his assumptions were made—he refused to provide the data, claiming proprietary ownership. So, at that point in time, no one could place much confidence in his work. The cost of Palo Alto provided telephone, data and TV came to about the same as the co-called “Triple Play” of Comcast at the time. Since then, AT&T has entered the TV content market with its U-verse product—offering data and TV and POTS service. AT&T has announced 1GB service in a couple towns, here and there. Presumably, AT&T could upgrade their U-verse service here in Palo Alto with VDSL easily, which uses the installed copper-wire base, but requires new modems to be installed in every user’s premise. And then there is Google—with it’s premium/free service that certainly would give any data/content/phone provider a run for its money. And, as a couple of posters have noted, there is at least one local fiber provider that will help to keep the pressure on any new providers. With the shift to wireless by so many people, we are seeing a slow, but certain, decline in the wireline business. Every quarter, one of the RBOCs (Regional Bell Operating Companies) announces a loss of wireline subs and a corresponding downsizing of field staffing. It’s very hard to believe that Palo Altans are really that much different that people in the other parts of the country. The wireless business is not standing still, by any means. A couple of companies have announced a 1-gig wireless 5G product within the next five years, targeting 2020 as the likely product availability date. Given that younger people are clearly hooked on mobile communications—it’s very difficult to believe that they will be spending $70-$100 a month on their cell phones, and then another $50 on a Palo Alto Fiber line that sits idle much of the day. The City’s foray in Fiber has not “blown anyone’s socks off”. While the City claims its cash positive, it would be nice to see a fully audited financial picture of this entity. It’s clear that very few businesses seem to have show much interest in PA.Fiber. The current council is listening to a small number of people on this matter, and not the public at large. The last campaign was supposed to bring new blood to the Council that would help to create a new ecosystem for self-governance. With this decision, all we see is that: “New Boss Same As The Old Boss”. I've noticed a couple typos .. sorry ..
> and didn't take advantage of that opportunity. What does this even mean? Perhaps Mr. Poggio can join us on this thread, and explain to us in some detail what he thinks he is saying? By the way, the US telephone system is the most stable in the world, demonstrating a 99999% availability across all of the US. Comments, as the one above, don't seem to be giving the "success" much credit. Attempting to install a city wide fiber optic internet system would be a colossal waste of taxpayer dollars, as is the 276,000 dollar consulting fee the city council just approved to develop plans for said potential system. Provo, Utah ended up millions in debt and wound up selling to Google for $1, as reported by the Daily Post today, and Alameda lost nearly 60 million dollars in city funds and bond money trying to do the same thing. They sold to Comcast. Given Palo Alto's penchant for mismanagement of public projects, this would be an unmitigated disaster that would take years to complete and cost many millions more than what will be bid to do the job. Tom DuBois was quoted in the article as saying "If we can update fiber, we can put Palo Alto back at the forefront." Forefront of what? Stupidity for spending multi- millions of taxpayer dollars for something that will be outdated as soon as it's finished? Let Google or Comcast foot the bill. Fix the roads and put utilities underground (something that has been promised for years) instead of wasting our money on this boondoggle. Most of us have internet service that we are happy with and if higher speed is needed, we pay for it. Palo Alto's reputation won't suffer a bit if we pass on this project. And if City Council insists, put it to a vote by the taxpaying citizens. The bottom line here is that the few people who imagine they will benefit from this service are hoping that someone else (e.g. the taxpayer or local businesses) will make the capital investment to run fiber to their homes. If you're not willing to pay $500-$3000 up front for this service, stop lobbying for someone else's money. We should all agree that the barriers to entry should be reduced - like predatory pricing from a taxpayer-subsidized city-run system, or Byzantine permitting processes that protect ATT and Comcast, or crazy opposition to wireless networking. To Wayne Martin....I love you, man !!!! You are a voice for reason and sensibility. Thank You for looking out for us. > treat our utilities and not turn it over to a third party." The Palo Alto Utilities are actually owned by the Municipal Corporation that is Palo Alto. There really is no “we” here. Moreover, the Utility is very opaque to the public. Attempts to get information from the Utility via public records requests have often been rejected, claiming that the business of the Utility was not open to public review. So—we are left with the question as to how opaque a PA.Fiber operation to the home might be? So .. who is “we” and why do "we want to control” the access to the Internet for Palo Altans and Palo Alto businesses? What exactly does Mr. Brand feel he will be "controlling"? Liz Kniss "thinks this is the right direction, but thinks this is the only way we'll find out if we're heading in the right direction." Sounds like the famous Nancy Pelosi quote where she said "We need to pass this bill before we know what's in it (referring to the Affordable Health Care Act)." We still don't know everything that's in it and what we do know is that we were lied to about a lot of its content. Echoing Wayne Martin's astonishment that someone in a position of making decisions for Palo Alto could utter such an argument against getting inexpensive and fast fiber from Google. Given all the failed past attempts, Poggio is proposing to spend tens of millions of dollars the city doesn't even have to attempt something that Google has offered to do for free! Just because he doesn't trust AT&T??? Come on Poggio. This is nonsense. Give us the real reason for your statement. Ashland, Oregon has a citywide fiber optic system, which it allows providers of network services in the area to use.I don't know what the financial arrangements are, but the system appears to be working well. I think it would be a mistake for the city to entangle itself in providing the service directly to residents, and I also think that if current providers were not going to be cut out of the picture entirely, they would not be inclined to throw up a lot of roadblocks. While it is reasonable to criticize the cost burdens to Palo Alto residents for a new broadband initiative, you also have to consider the huge amount of money wasted by PA citizens paying for Comcast or AT&T broadband. Palo Alto has about 28,000 households. If each household pays $50 as I do for mediocre broadband speed that is roughly $16,800,00 per year. And I agree that Wireless has much potential and will play a bigger role in broadband going forward. An ideal system might provide fiber to the block with wireless to the home. But you have to consider how wireless technology has to share the bandwidth. Verizon offers 20MB 4g over cells - unless the cells are overoaded with too many users. "Palo Alto has about 28,000 households. If each household pays $50 as I do for mediocre broadband speed that is roughly $16,800,00 per year. " You think that fiber is going to be cheaper than that? Google Fiber is $70-$80/month. Given how much waste there is at CPAU (just need to look at your monthly bill to see all that waste paper), I'm not sure our utilities would know how to do it efficiently. Rather have them just contract out the last mile to others. "If we can update fiber, we can put Palo Alto back at the forefront." Yep. It's all about ego. Organic, unadulterated ego. Prior attempts to get fiber deployed to PA citizens have ended up in the drink because they were not through through. Palo alto's first attempt died because there was no effort to successfully pre-market the idea to PA users. Instead, a small group of fiber proponents talked the city into a trial, along with hiring a consultant for more than $200K. The whole idea rested on the "if you build it they will come" meme. Some very good objections were brought forward by one or two brave souls who differed in the the kind of objections brought. Wayne Martin (who writes, above) was one of those persons; his reasoning was very much in line with his long-time philosophy of keeping municipal dollars out of competition with commercial providers. Yet another local resident with deep business experience performed a line-by-line evaluation of the business plan and found it wanting. Others claimed that Comcast, ATT, etc. would cost Palo Alto is a lawsuit, as they had - and continue to - threaten municipalities who would challenge their local contracts with municipal competition as essentially "unfair" competition. A lot of the telco/cable rationale for that position may be hurt with the FCC's upcoming ruling about how Internet service will be labeled and delivered as a utility. PA's second effort failed because the time was not right (there was a huge economic downturn); and, it was largely pushed forward *again* without making an effort to reach out to citizen taxpayers, who are the real stakeholders. The fiber effort has always been pushed by a very small group of determined, passionate proponents who (mostly) get the technical part right, but don't understand the marketing and operations and sustainability efforts of a consumer fiber deployment. It's important to understand that the first effort - had it succeeded - would have been managed and operated by Palo Alto's Utility group. Yet, at the time, there was nothing in the business plan that detailed what kind of personnel and operational upgrades would be necessary to deploy and operate a fiber network. This is something that - for $200K - should have been in the consultant's business plan (it wasn't). All that said, IF 1) a reasonable means to scoring an effective municipal deployment and operational plan can be cobbled together; 2) a SERIOUS and EFFECTIVE effort made to reach out to PA citizens re: the benefits of fiber (which are many, and DO exceed wireless benefits) - including how much it will cost citizens, and explained in a way that helps them to see cost AND operational advantages...IF these things are done and a proper, $u$tainable ( use the dollar signs for a reason :), operational base can be created, then Palo Alto should go forward with this plan. American telco and cable companies have done everything they can to monopolize communications; they ACTIVELY fought Internet innovation in the 90's; they have done everything they can to throttle ANY community (even communities that they won't deploy to) who wants to bring more capability to its citizens; they have regularly lied about promises to deploy fiber *universally* (even though they have been payed special service fees in the multi-billins to do so); they have been absent customer service and accountability to their customers; they have colluded on price; and last, they have used their corporate power to - over years - keep American communities from being as competitive as they can be; they have kept America and Americans from our true potential. Due to poor marketing attempts in prior attempts (something that the current Council needs to be VERY aware of) and very poor business modeling - along with Council temerity - prior attempts failed. The fiber effort CAN be done right. Let a multiplicity of voices in, WITHOUT letting the "Palo Alto Process" take over. Last, given the above ingredient list necessary to successfully deploy fiber, there is simply NO technological argument that has enough FACTUAL weight to argue against it. Most of the naysayers are going to be persons who don't want to see PA involved in running a business, which is silly. There is no reason that a municipality - properly staffed - cannot not run a utility. Also, there is NO wireless technology that can come close to touching the inherent advantages of fiber, long term. typo - - First sentence in my post (above) should read "Prior attempts to get fiber deployed to PA citizens have ended up in the drink because they were not through through. " It's amazing to me that this is still up for debate in 2015. Our appetite for more and more data is only going to continue to increase. People are getting 4K and Ultra HD televisions which require more bandwidth than the typical 15 to 20 Mbps that we get in Palo Alto. Wireless technologies like LTE just can't cut it for those speeds; LTE is about bursting to high speeds, not sustaining something like watching a movie. The fact is most of the industrialized world has cheap high-speed broadband, and we, in the middle of the Silicon Valley, are stuck in a duopoly which has been absolutely strangling us. Why can't we just get this done? PLEASE fix the Baylands. The streets are bad, the Boardwalk is falling into the water and no longer accessible, the Interpretive Center is falling into disrepair, and the porta potties need replacing. Do you CARE??? If you want to see additional statements of the various perspectives to help in forming your own questions and opinions, you may want look at the coverage from an earlier iteration of this debate (in October 2013). There was a news article (Web Link) with lots of comments. I blogged about several of the questions and concerns ably raised above and there were comments on that thread (Web Link ). My sense from the news reports on the deployments of Google Fiber has been that the customer response has been underwhelming. In looking at the number of sign-up, I filter out those for the free/cheap low-speed connections (speeds similar to what you can get here from Comcast and AT&T) and see what seem to be too few at the high speeds. I would expect that a portion of these are customers who don't need/can't use that speed, but it is a status symbol (but I know of no attempt to quantify that portion of the market). To my knowledge, no one has satisfactorily answered the long-running question (posed in that 2013 blog entry, but it was already old then) of what is going to fill "the big pipe" -- the upstream network and servers routinely can't fill the "pipes" we already have. The "answer" of streaming 4K TV (mentioned above) is not credible to me. If you look at the transition to HiDef TV from standard definition, you would project that a transition to 4K will be very slow. People forget that replacing TV sets is a tiny portion of the problem -- expenses for the content producers was staggering (sets and techniques that look fine at one resolution look cheesy and laughable when viewed at higher resolution). Plus I have been told by friends who revel in bleeding edge tech to *not* get a 4K TV set, even if price is no object, because the upscaling of images recorded in HiDef too often does not work well, hence any claim about "future-proofing" is questionable (Aside: I'm not willing to invest the time to learn the details - the absence of non-trivial content that *requires* or *benefits* from 4K is a deal-killer). This is not an invitation to debate that aspect, but rather a heads-up for something to look for in any projections of the transition to 4K TV. Here comes Palo Alto Cable Co-Op v.2. There are so many other projects that Palo Alto should prioritize over this "nice to have" project. In other words, projects that benefit everyone in Palo Alto, not just the tech hungry crowd. When I look at the preceding comments, it reinforces the sense that there has been narrow thinking about fiber in PA, since the very inception of the idea. The early promoters were the "if you build it they will come" types; they were all tech savvy and could envision all kinds of cook 100Mbyte badnwidth (up/down, per second). Again, in order to deploy a sustainable network, CONSUMERS HAVE TO BE EDUCATED ABOUT THE POSSIBILITIES. What are we going to get from the telcos and cable companies as this development evolves. Answer? Higher fees; broken promises; barriers to learning; even worse customer service. What I never understood about Palo Alto is how so much superb human capital gets wasted. This isn't about some newfangled HD TV innovation; nor is it about whether or not municipal government has the capacity to deploy and operate a sustainable fiber network. Rather, it's about INFORMED community WILL. We have heard all this before. It remains to be seen whether the Palo Alto Process will end up infecting the fiber initiative a 3rd time. Everyone - from homeless persons, to medical patients, to educators, to students, to entrepreneurs, to police and other public safety services would be well-served with a well-deployed, sustainable fiber network. Can Palo Alto advocates for fiber get out of their own way - foregoing the wasteful of human capital Palo Alto Process - and get this done? We'll see. "Darkfiber" just won't die, will it? Can you imagine the mailings comparing your data use with your neighbors! The idea is pretty funny. I never said I wanted cheaper prices. I want better value. My current rate of $50 buys only 5 mb of bandwidth. If Google sells 1 GB of bandwidth for $100, it would cost me $10,000 / month at my AT&T cost to equal the $100 cost from Google. By the way, most places offering ultrafast bandwidth can supply lesser amounts of bandwidth at a fraction of the cost of AT&T or Comcast. If you search international bandwidth growth you'll see it has been at least 50% per year since 1984. In the coming years, all video and TV will be delivered via the Internet and you will not be able to live with the paltry bandwidth offered by most AT&T installations. Hopefully Google will want to invest in Palo Alto. If not, Palo Alto needs to do so. In the United States we have an oligopoly for telecommunications. Prices in Europe for cell phone bandwidth is a fraction of what you pay here. @Wayne Martin: " As it turned out, most people were not purchasing the very high speed service, but option for DSL speeds." - do you have a citation for that comment? I've been following the debate with interest, good points made on both sides. 1. There is a lot of misinformation out there. People are jumping to a conclusions with a lack of information. For Fiber to work, the city will need to communicate clearly and loudly. I agree the City needs to reach out early, explain the benefits, the costs and exactly what is being discussed. That has not happened yet. I'd also ask PatrickD, Do It Right, Jim Holsworth, and Jim Hols to get in touch with me (and anyone else that wants to discuss this issue) via my website or tomforcouncil@gmail.com. What is happening now is creation of a strategic planning document - evaluating potential business models based now on the experience of many other cities across the US who are successfully providing boardband to the home. There's a wide range of possibe business models, from the city owning the physical cables and letting a free market provide service on top all the way to the city prodiving everything direct to residents (retail model). A lot has changed since the city evaluated this before - we have many over-the-top video services like Netflix, Amazon, HBO, ESPN, etc. Voice over IP is much more common now. The Internet of Things, with households now having many more devices connected to the network. So in mind, business model is critical. I want to see the report, but I am personally skeptical of the full retail model. Having someone like Sonic or another provider bid to manage the service for the city may be a great way to go. The City's finances are not 100% discretionary, in fact most of it is not. Utilty funds are separate from the general fund and can only be used on things related to the specific utility - separate for water, gas, electricity and fiber. Our fiber ring has generated a reserve of $20M that can only be used on Fiber. Again, I need to see detailed plans, but it is looking very feasible to fund installation of fiber to the home by leveraging those dollars. Evaluting fiber doesn't mean the city isn't doing anything else. The Baylands ARE getting fixed and that is a personal priority for me. Other things mentioned also have high priority and are allocated in other budgets, roads, infrastucture, fire stations etc. This is not and "Either Or" choice. > “CONSUMERS HAVE TO BE EDUCATED ABOUT THE POSSIBILITIES. "Do it right," you keep saying this, so why not give us some examples of why the average person needs fiber? So when will that communication – about benefits and value – start? It’s already too late. LOTS of money has been spent in the last 10 years and all we’ve heard is that the business plans have failed, i.e., the city threw our money away. Now you tell us there’s yet another “strategic planning document” in the works. Why should we have confidence at this point? When fiber becomes part of city utilities, what percentage of resident fees will be deposited into the general fund? Right now the biggest benefit to gigabit+ speed is for multiuser households. If you have kids who watch netflix you'll know what I mean. 640K was enough memory to some people at a time way back when. "Again, in order to deploy a sustainable network, CONSUMERS HAVE TO BE EDUCATED ABOUT THE POSSIBILITIES." Uh, we are the consumers, I feel plenty educated about the "POSSIBILITIES." Actually Google has been able to get away with developing "fiber-hoods" based on demand. Rather than being forced to deploy on a wide-scale immediately, they can go where enough people are willing to pay for it. That seems to be a sensible, market-based approach to deploying fiber. Now, with Title II on the table, I'm not sure if Google (or Sonic) will be able to get away with that approach. After all, the FCC mandates that we all subsidize phone service to rural areas. Who knows what will happen once Title II is enacted. > Dubois: "2. Business Model // What is happening now is creation of a strategic planning document - evaluating potential business models based now on the experience of many other cities across the US who are successfully providing boardband to the home." The City has been through this enough times that many of us think that there should *already* be rough outlines of the potential business plans and that there should be a FAQ that gives credible answers to the questions that arise each time this issue comes up. "@Wayne Martin: ' As it turned out, most people were not purchasing the very high speed service, but option for DSL speeds.' - do you have a citation for that comment?" That information was the sort of thing that should have been in the Staff Report, that is, an argument for why the situation has changed enough to warrant a deeper exploration. I looked through the Staff Report (154 pages) and didn't spot the answer to this or similar questions. I would have expected Staff and the advisory group (of residents) to have done a better job of dealing with the questions both in order to determine if it was reasonable to proceed to getting a consultant's study and to provide enough structure and expectations for that study so that the City doesn't once again wind up with useless results. @Doug Moran - the reason I was asking Wayne Martin for a citation is that I suspect his data is stale. 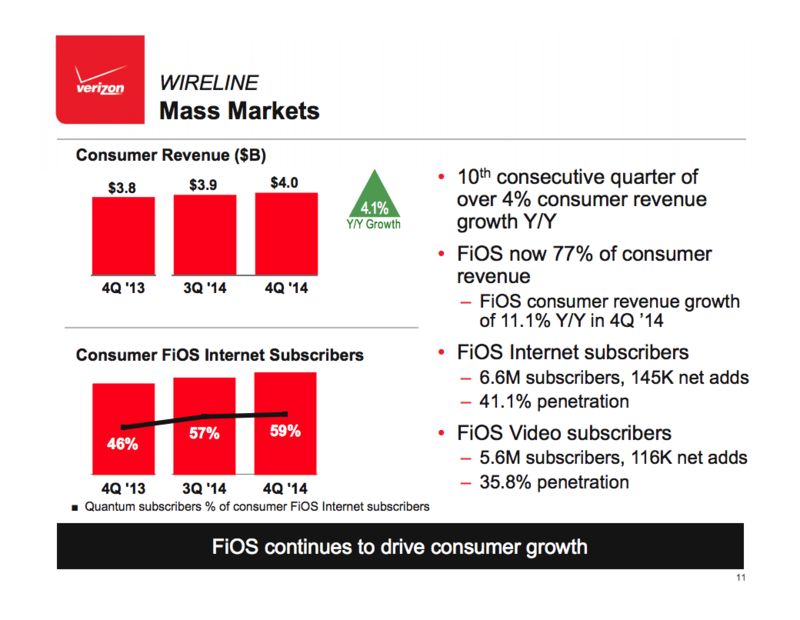 Here are some numbers from Verizon on FIOS from their last earnings call. "Strong adoption of Quantum continued, as 57% of our FiOS Internet customer subscribed to the higher speeds ranging from 50 to 500 megabits per second." I.e., a majority of FIOS customers are upgrading speed to the maximum, not option for slower speeds. "In broadband, we added 162,000 net FiOS Internet customers in the quarter and now have 6.5 million subscribers, representing 40.6% penetration." Doug, I agree that staff should have provided more information – and council should have demanded it. Whatever happened to the idea of ensuring that staff reports are more cogent (clear, logical, convincing)? I remember all the complaints when Palo Alto first built its fiber ring years ago. I understand this has been a solid money maker for the city for years and has long since paid back its investment. I hope the city is able to find a model to bring Fiber to the Home that is cost effective. I am so tired of Comcast and ATT. There is little chance that a city plan will succeed. 1. A full roll-out would cost over $100M. This is a lot of money to get. The city will find that it needs private partners, and they will be hard to find. It will prove politically difficult for the city to put more money into this than what has been accumulated through the "dark fiber" project. 2. There are two incumbent services, Comcast and AT&T. After years of trying literally everything, I have stabilized on Comcast and it works! We have their 50mb service (downstream is generally over 60mb when I test it). Comcast also offers 105mb but I don't need it. Note to those who use AT&T: investigate Comcast. 3. While 1GB is surely coming, the applications for it are not ready, and "normal customers" will not notice much improvement today between 50mb and 1gb. We are actually at the point where the "last mile" is not the bottleneck in many cases. If you have 50GB of service, you are going to find even the most demanding streaming sites to work very well. 4. This is a very complex business and is changing very rapidly. Cities are not very good at it in general and rack up big losses. A decade ago, the "poster children" for municipal fiber were Provo, UT, the Utopia consortium in UT, Alameda, CA, and Ashland, OR. These have all failed and created big messes in their communities. Today, fiber advocates point to Lafayette, LA, and Chattanooga, TN. It is however too early to tell about these systems, and there are many counter-indications for both today if you look beyond the hype. 5. In order to pay for a massive roll-out, the city will have to have a significant marketshare and will have to take a lot of share away from the incumbents. This will be extremely difficult. The incumbents will respond quickly with faster service and lower prices in an effort to keep the marketshares they already have. The Cox system in Lafayette LA is an example of this. 6. Every few years, the city council changes and newly elected members want to do something spectacular. So, we are back again with consultants and new plans about fiber. This has been going on for at least 18 years, and actually back into the 70's when the PA council very much wanted to get into the cable TV business. So, we will spend fairly small amounts of money on consultants (a quarter mil isn't much is it?) and have more meetings for a few years. I very much doubt that the city will make a huge investment in fiber, so the question is whether private capital wants to work with the city. I notice that Mr. DuBois has joined this conversation, thanks very much for your time. I do hope that you start to examine the entire range of issues here. Soon as I read the statement saying the city had struggled with this for more than a decade I laughed out loud. Back in the 90s my husband did some networking projects for the City. At that time fiber optics was already taking off and he tried to get some interest, and ACTION, on building a fiber optics "ring" around the City. Others were talking about it at the time, it wasn't just my husband's idea. Palo Alto, heart of high tech, wealthy, highly educated, home of Stanford Univ. STILL doesn't have it! It's absurd! It should be highly embarrassing! You'd think that nearly everyone would benefit from it. Yet nothing has happened for more than 2 decades. If ever there was a perfectly ridiculous example of how NOT to do things, this would be it. Oops! Seems the ring part of it has been built but still no connection to homes and businesses. We moved away in 2008. I don't remember whether the ring had been built by then but didn't matter since it was still unavailable to us. Sorry for the error about the ring itself, my husband died 4 years ago so I couldn't verify with him. I do know that he was pretty disgusted with the City after dealing with them on some projects. One project was at Lucie Stern and the things he had to go through for a relatively small project were ludicrous. I helped him with the heavy documentation requirements. @Robert Smith - on one hand, Comcast has been improving their speeds, but the bandwidth cap still looms. If you were able to fully utilize you 50mbps connection for just 6 hours, you'd hit the 250GB cap in just 6 hours. It is like selling a sports car with a 1 gallon tank. Also, the reliability is still questionable. We probably are down a few hours a month. I don't want the city to become an ISP, but the only way to drive progress is to get some competition to pressure Comcast and AT&T. The city has an asset in the dark fiber, it should use it to help lure in a Google, or a Sonic, or whoever to wire the last mile and run the service. In our years with Comcast, we have 3-5 computers at a time accessing the internet heavily, with 3 of us often telecommuting. We have never had a problem with a cap. Lucky perchance? One of the myths about municipal fiber is that cities will be free from all of the inconvenient restrictions imposed by private companies. In practice, this has not happened. Caps, early termination fees, servicing profitable areas first and best, dropping low-cost (and unprofitable) tiers, have all appeared in municipal systems, sometimes after a few years when they figure it out that they are losing money. We tend to believe that because "the people" own it, it will serve "the people". In the history of government-owned telecom monopolies, they proved themselves to be far the worst. I remember doing research in France in the 70's, and the people I knew told me that it took a year to get a phone installed by the government! And there were no phone directories, so people passed around their own lists! People would say, "You are lucky to have AT&T in America!" Things have improved in France, they now have a lot of private competition. @Robert Smith - Comcast temporarily suspended their bandwidth cap, but they are starting to roll it back out in parts of the country. You can see your usage on your account page. there should be a graph in the right column. I'm at 153 GB, just 6 days into Feb. If you click view details, you can see your three month usage history. We're averaging >400GB a month. Anyway, point is that speed is just one of the areas that could use improvement. Think of services like cloud based DVR, cloud based back up, cloud based security cameras, 4k streaming. Or Amazon WorkSpaces where you can run your desktop remotely. More speed and more bandwidth is the future, it is just a question of whether Palo Alto will continue to lag behind or not. Thanks, I have been following it actually. It has historically been very hard for municipal telecommunications facilities to have access to capital to make improvements. Broadband/cable has changed so rapidly that things get out of date very fast, and cities don't seem to keep up. Generally, when a municipal fiber system goes broke, they find that the equipment is old and needs replacement, giving the system less value that you might expect. When Google took over the iProvo system from Provo, UT for $1, the city had to spend about $1.5M on engineering, mostly creating proper documentation but also some equipment changes. I believe that our incumbents are more likely to keep up than the city will be able to do. Palo Alto is not "behind" on broadband, it is right where the market is right now. I wonder how many home subscribers are using 50gb or 105gb service. Typically in most markets, customers mostly select cheaper tiers, which suggests that they don't need the extra speed in the first place. Our most serious area for telecom infrastructure is cellular. In this case, the city has made it very difficult for companies like AT&T to install more equipment, although they keep trying to overcome the Palo Alto process and get the equipment we need. We were promised new ordinances that would simply the approval process but the city hasn't done anything about that! @Robert Smith - "customers mostly select cheaper tiers" this is not true - see my earlier post. In the case of verizon, for example, 57% choose the top speed tiers. If you are saying Palo Alto has average speeds, yes, I agree, but sitting in the middle is being behind a lot of people. We are behind cities served by Verizon FIOS or Google Fiber. Note that AT&T is pushing out fiber and gigabit connections in areas where Google is expanding. So we need competition to drive improvements. How does Sebastopol get gigabit, but we sit here in silicon valley stuck with Comcast? Clearly many customers are sophisticated at evaluating the price/performance curve and finding something that makes sense for them. It would be interesting to know what percentage of the Comcast customers in Palo Alto are using each of the tiers. If their 105mb package is not getting a lot of use, it might suggest that 1gb is not going to be a big draw, unless of course the city can drop prices by some ridiculous amount, which seems unlikely. The evidence seems to be that municipal systems, despite their early intentions, morph into policies and behaviours that broadband activists have decried. The rules of econonics, technology, and consumer behaviour do not change because the provider is the city. @Robert Smith -- 02-05-15, 12:02 pm -- "A full roll-out would cost over $100M"? I don't think so. In 2013, Longmont bonded for $45.3 million to implement citywide municipal FTTP there, and its population is 40% larger than Palo Alto's. "A decade ago, the 'poster children' for municipal fiber were Provo, UT, the Utopia consortium in UT, Alameda, CA, and Ashland, OR"? I don't think so. Alameda and Ashland were HFC, and the City's 05-07-03 report on municipal broadband alternatives was already saying that we should do FTTP, not HFC. Ashland Fiber Network (AFN) continues to serve its community, so it's not a complete failure, although it hasn't yet repaid the cost of deploying the infrastructure. A decade ago, the municipal FTTP networks in Provo and UTOPIA were just getting started when state legislation severely limited what they could do. Is it "too early to tell" whether the municipal FTTP networks in Chattanooga and Lafayette are successful? They started in 2007. Are there "contra-indications to both if you look beyond the hype"? In this document, MuniNetworks' Christopher Mitchell debugs some of the alleged problems with Lafayette. The "Colorado company," Uptown Services, produced three reports, a FTTH Business Case (12-04-02), a FTTH Business Plan, Phase 1 (05-07-03), and a FTTH Business Plan, Phase 2 (03-17-14). Independently, staff determined that there might be problems with bond financing the network, so Council did not move forward. In the 2006, the City issued an RFP asking bidders to build a citywide FTTP network, run it, pay for it, and after a while give it to the City. Unfortunately, the 180 Connect consortium -- consisting of 180 Connect, PacketFront, and a financing entity -- agreed to this in principle, and the City accepted their bid, subject to a negotiation of the details. Negotiations of the details ensued. Over the years, the financing entity changed. Eventually, it became Axia. Axia wanted a different deal than the RFP required. Eventually the negotiations reached an impasse and negotiations ceased in 2009. The consortium never published a business plan, in part because the City refused to pay for one. (After all, what it would cost the consortium was the consortium's look-out.) But they did publish an "overview,"
in which they estimated that construction would cost $44.2 million. However, that assumed incorrectly that 60% of premises required undergrounding. The City's dark fiber network is great for businesses that can afford it. But to democratize fiber, you need FTTP.